Apple iPhone SE Troubleshooting: Why is iPhone SE iMessage not working? This post is addressed to a query on why the #iMessage is not working on an iPhone SE (#iPhoneSE) handset. Aside from troubleshooting guides, this content also highlights some helpful tips for you to get the best possible iMessaging experience with your iPhone. If you too are having trouble or getting errors while using iMessage on the same device, then you may consider reading this entire content to learn how to diagnose and resolve the underlying cause of the problem. One of the most significant features of an iPhone is its built-in instant messaging service called the iMessage. It is a special form of messaging service the Messages app integrates. iMessage is designed for use among various line-ups of Apple devices including Mac computers, iPads, and iPhones to send different types of messages including text, photos, audio, video, location, as well as standard carrier SMS/MMS messages to anyone on any phone. With iMessage, users of any of these devices are able to send text, photos, videos, sound, and location quickly and easily to anyone else on their Mac, iPad, iPhone, or Apple Watch via iMessage. Needless to say, iDevice owners are indeed in trouble when iMessage is not working on their respective devices. Now, before we proceed with our troubleshooting, if you have other concerns with your new iPhone SE, drop by our troubleshooting page for we have already published some guides and tutorials. You may also contact us by completing our iPhone issues questionnaire. This is a free consultation servicer we offer and all we need is information about the problem. So please give us that so that we can help you better. Why is iMessage not working on your iPhone SE? In iOS 10, significant updates are brought to iMessage such as bubble and screen effects, emoji tapbacks and full-on emojification. And for the first time, iMessage apps are now made available, along with Digital Touch and handwriting features. All these and more are promising users with an incredible, powerful, and unified iMessaging experience. Considering the fact that millions are using the iMessage service, Apple must have programmed it to be well-structured and stable as possible. Many cases of iMessage issues are associated with network-related problems on either Wi-Fi or cellular data networks. An active network connection is required in order for you to send or receive messages on your iPhone. Thus, when network problems occur, the iMessage service may likewise be affected. Network issues can arise due to inactive account status, outages or scheduled maintenance. Other cases are tied to an incorrect network configuration on the device as well as software glitches. Major and minor software updates can also result to certain apps malfunction including the Messages app on your iPhone. In worst case scenarios, network problems can be due to a faulty hardware like a damaged network component on the phone. How to fix iMessage problems on your iPhone SE? There are many ways for you to resolve problems with iMessages on your iPhone. The best way to start is by looking into the changes or actions that have been made on your device before iMessage stops working properly. Please note though that following solutions and recommended workarounds are only applicable if the problem is software-related. Unless a hardware damage is present on your device, you can give any of these methods a try and see which of them would be able to fix the problem. Note: Be sure to test iMessage after completing each step to see if the problem has already been resolved. Otherwise, continue to the next step or method available for you to try on. Step 1. Verify and ensure that the iMessage is properly set up on your iPhone. Incorrect iMessage setup on your iPhone is among the most common reasons as to why iMessage will not work as it should. In order to use this service, iMessage has to be enabled on your device. To verify if iMessage is enabled, go to Settings-> Messages, and then check the iMessage status. Step 2. Make sure your iPhone is connected to data through either Wi-Fi or Cellular network. Your iPhone must have an active connection in order for you to use iMessage. You can use either Wi-Fi or Cellular network on your device. You should see a data indicator at the top of your iPhone screen when it is connected or active. Step 3. Verify and ensure that the Apple ID or phone number set for your iPhone is listed in the Send & Receive section on the Messages app settings. Go to Settings-> Messages-> Send & Receive. Tap on Use your Apple ID for iMessage, then sign in with your Apple ID. Enter or select your current phone number and Apple ID under the You Can Be Reached By iMessage At section. Step 4. Disable iMessage, reset network settings, and then enable iMessage again. Go to Settings-> Messages and then turn iMessage off. Go to Settings-> General-> Reset and then tap the option to Reset Network Settings. Please note that this process will erase all your network settings including Wi-Fi network credentials. Be sure to take note of them before you proceed. If necessary, enter the PIN number. Go back to Settings-> Messages, and turn iMessage back on. 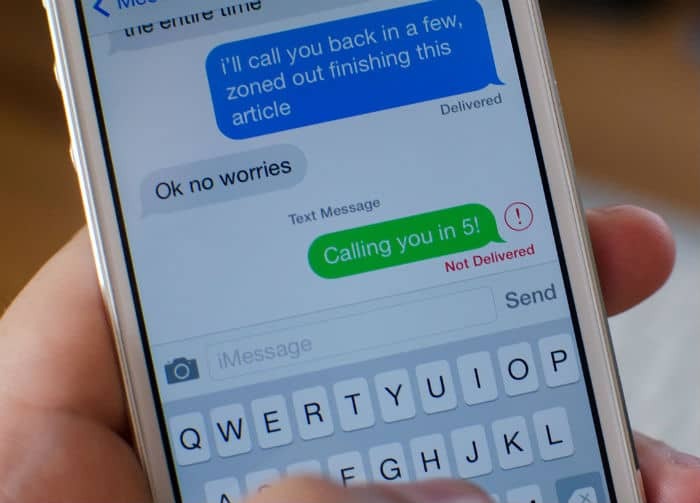 Now create a test message using the Messages iMessage service on your iPhone and see if it’s already working fine. Step 5. Perform a soft reset. From the Home screen, press and hold the Power button and the Volume Down key. When the Apple logo appears, release both keys. Wait for your iPhone to restart completely, and after that try to use iMessage again to see if it is already working properly. Step 6. Verify if Reduce Motion is disabled. By any chances, you may have enabled the Reduce Motion feature on your iPhone to turn off parallax effect of the apps icons and to lessen the use of animations. For some reasons, enabling this feature can also trigger issues to arise, particularly with the iMessage effects in iOS 10. Some iPhone owners who have encountered the same problem have resorted to a temporary solution which is to disable Reduce Motion on their handset. You too can give this workaround a try by going to Settings-> General-> Accessibility-> Reduce Motion, and then toggle the switch to disable or turn off the feature. After disabling Reduce Motion, go back to iMessage and see if that has fixed the problem on sending or viewing iMessage effects on your iPhone SE. The following solutions are based on what is causing the problem to occur on your iPhone SE iMessage as depicted by error codes, warnings and prompts. Step 1. Check and ensure the date and time settings are correct. Adjust the date and time. Alternatively, you can also set date and time automatically by going to Settings-> General-> Date & Time, then tap to select the option to Set Automatically. Enabling this option automatically sets date and time on your iPhone based on your time zone. You will be prompted if a time-zone update is available on your device. After you configure the date and time settings accordingly, toggle iMessage off and then back on. To do so, go to Settings-> Messages-> toggle the iMessage switch to turn it off and then back on. Step 2. Tap the option to re-send a message. Tap the red exclamation point and then tap to select the option to Try Again. If you still cannot send the message, tap the red exclamation mark again, and then tap the option to Send as Text Message instead. Please note though that choosing this option may charge you with messaging rates. For more information on messaging rates, contact your carrier. If the iMessage is still not delivered or won’t send, be sure to check and ensure that the phone number or email address of the recipient contact is correct. Also verify if your iPhone SE is connected to a Wi-Fi or 3G/4G network. Step 3. Delete existing conversation and start a new one. Locate the conversation you want to delete. Swipe left over the desired conversation. Tap Delete to remove it. Once the selected conversation has been deleted, start a new one through the next step. Tap the Create New Message icon. Enter the phone numbers or email addresses of the contacts you want to include in the new group conversation. If you want to add attachment, touch and hold the file you want to attach, tap More and then tap Save. Finally, tap Send to deliver your message. Note: Once you have deleted a conversation, you will not be able to recover it. You can take a screenshot if you want to save parts of a conversation. If none of these works on your end and that you still end up having problems with iMessage on your iPhone SE, then I suggest contacting your carrier or Apple Support to escalate the problem and ask for further assistance or recommendations. In case you are getting an error messages or codes while attempting to use iMessage, be sure to take note of them for they can be used as clues when troubleshooting. That way, you can work straight on the root cause thus save time and effort. Visit our troubleshooting page to view more solutions to other iPhone problems we have addressed in our prior posts. If you wish to reach our iOS support team for further assistance, then you may do so by filling up this form with all the required information. Be sure to provide us with the significant details of the issue that you need help with so we would be able to give you the best possible solutions and recommendations to try on.